April 1, 2019: The contractor is anticipating getting started the first week of June and will begin with concrete work on the western section (between Marshall Road and Ackerman Blvd). After the concrete work is complete, they will mill and pave the road. March 22, 2019: This project is expected to begin in June 2019. March 12, 2019: The project will be completed in two phases, starting in spring with the work between Wilmington Pike and Marshall Road. Phase one will include the removal and replacement of curbs and drive approaches. Phase 2 will start once school is out and will include the removal and replacement of curbs and drive approaches in the section between Marshall Road and Ackerman Boulevard. 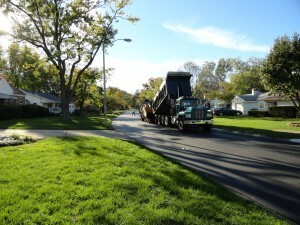 The contractor will complete the project with the final removal of the asphalt surface and paving. Bid Date: February 14, 2019. The project includes resurfacing of East David Road from Ackerman Blvd to Wilmington Pike. This includes the removal and replacement of the asphalt surface, as well as related items (pavement markings, traffic detection, etc). The project also includes the removal and replacement of deteriorated curbs and drive approaches. Project Engineer: Chad Ingle, P.E., P.S.